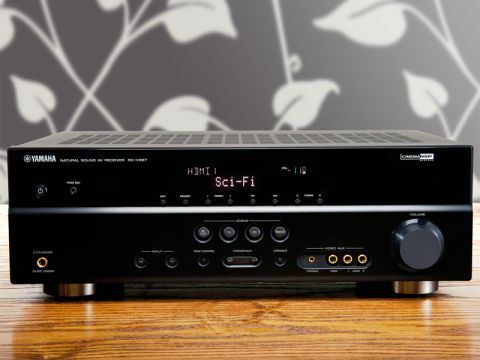 With a price that dips below £200 from some online retailers, the Yamaha RX-V367 is the cheapest AVR in our roundup and solid evidence that you don't have to pay through the nose for 3D-readiness. Support comes in the form of four HDMI v1.4 inputs and one output, which is generous enough to fit your 3D player, Sky box and games console, leaving one for future expansion. The look is classic Yamaha. A moody black finish and sharp angled lines are the order of the day (it also comes in titanium and silver) while the front panel is a hive of activity, with buttons, displays and sockets aplenty. Most noteworthy are the 'Straight' button, which bypasses the unit's listening modes, and four Scene macro buttons. On the back, there's evidence of cost-cutting in the shape of springclip terminals for the centre and surround channels and no iPod dock connection or surround back pre-outs. But the lineup of other sockets is useful, with four digital audio inputs being a highlight. There's no on-board HD audio decoding, though, which means Dolby TrueHD and DTS-HD Master Audio soundtracks have to be decoded by your player beforehand. This isn't a major problem if you trust your deck's own abilities, but does make you wonder how the others managed it at a similar price. Yamaha makes up for this with an obscene amount of sound modes and virtual surround processing, plus the YPAO auto calibration that makes it a cinch to optimise. The lack of onscreen menus is a shame, but the logically structured front-panel display makes it easier to set up than you might expect. And, aside from a few undersized buttons, the remote is also terrific. In general, there can be few complaints about the RX-V367's sound quality for the money, although it inevitably lacks the sonic polish that turns a good receiver into a great one. The sound is dynamic and detailed; the receiver digs out the subtleties during Avatar's many rainforest scenes, filling the soundstage with distant cries and swirling ambience. Fluid rear-channel steering and crisp separation makes for an absorbing listen. Voices are prominent and cleanly detached from the rest of the action, while punchy bass response lends decent depth to the explosions and gunfire during the Battle for Pandora scene. However, this scene also exposes brightness in loud high-frequencies that betrays its budget price tag. But if you can tolerate this and work around the lack of HD audio decoding, then the RX-V367 makes a decent purchase.